If you live in Southern California or if you’re headed there this summer, chances are your plans will include a trip to Knott’s Berry Farm. 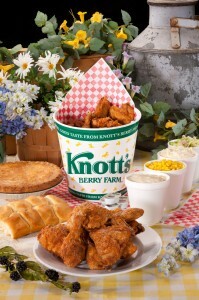 Knott’s Berry Farm is perhaps best known as an amusement park and entertainment center, but it has its true roots in food: The park was originally created to give the crowds something to do while they waited in line at Mrs. Knott’s Chicken Dinner Restaurant. Also – here’s a fun food fact – all boysenberries can trace their roots back to Knott’s original farm. So you know you’re going to eat well at Knott’s Berry Farm, but where do you start? Earlier this month, Knott’s Berry Farm invited the Jolly Tomato to try the latest menu offerings (as well as the classics) and we’re happy to give you the “scoop” on what you can eat and where you can find it. First things first: You can’t go wrong with Mrs. Knott’s classic chicken (recipe unchanged in 78 years), biscuits, and boysenberry pie. The chicken restaurant story goes like this: In the 1930’s, berry farmer Walter Knott was struggling to make ends meet, so he asked his wife Cordelia to serve her famous fried chicken to visitors who stopped by the berry stand. She sold her first six dinners in 1934 for 65 cents each. By 1940, the word had spread and the restaurant was serving as many as 4,000 dinners on Sunday evenings. Today, Mrs. Knott’s Chicken Dinner Restaurant is the world’s largest full-service restaurant that serves chicken as its main course. It can seat more than 900 people at one time, and it serves more than 1.5 million visitors per year. The boysenberries came about when a nearby horticulturalist, Rudolph Boysen, was experimenting unsuccessfully with a new strain of berry. Walter Knott took the scraggly plants, nurtured them to health and named the berry – a cross between a loganberry, red raspberry and blackberry – after its originator. 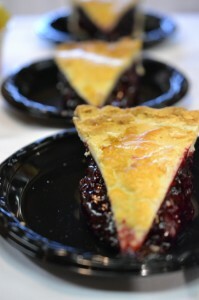 Seventy years later, boysenberry pie is still one of the most popular fixtures on the Knott’s menu. If you’re looking for something beyond chicken and pie, there are plenty of tasty options at each of the food stands. At Fireman’s Brigade BBQ (located in Ghost Town) you’ll find slow-cooked ribs and flank steak sandwiches; while at Bigfoot Broiler (adjacent to Pony Express) you can chow down on a chicken kabob sandwich. 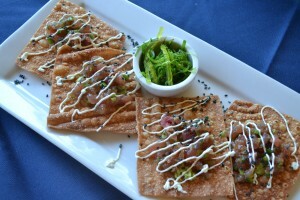 You can go a little crazier at Spurs (located across from Ghost Rider), where you can get some tomato bruschetta, Hawaiian ahi poke on wonton crisps, or Cajun lime salt riblets (pork rib tips). At the Ghost Town Grill (across from the Blacksmith) you’ll find a vegetarian black bean burger and a honey-garlic salmon with baby spinach salad. 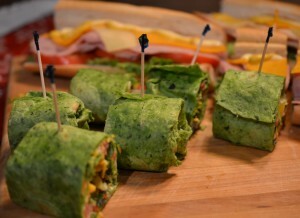 And at the adjacent Soak City water park, you can chill out with classic deli sandwiches, veggie wraps, or gluten-free pizza. Veggie wraps and gluten-free pizza? Is this really an amusement park? Absolutely, says Russ Knibbs, the affable vice president for food and beverage at Knott’s. Knibbs says he wants people to come to the park to “enjoy the experience, enjoy the food, and appreciate the value.” He’s definitely on to something there: A complete chicken dinner, with all of the trimmings, side dishes, and dessert is $16.90; many of the food options are under $10. Tempted to go and fill up? Well, before you leave, save some room for one of the “fully loaded” funnel cakes (topped with vanilla soft serve ice cream and your choice of strawberry, apple, or boysenberry topping) for $10.99. Consider this one a family-sized treat – and don’t blame us if you’re too full to ride the roller coaster afterwards.